It is the best ecommerce website. It is powered by Tesla Framework. Zeon is a multipurpose theme. It is included in premium eCommerce WordPress theme. WooCommerce is the popular eCommerce toolkit for WordPress. WooCommerce is providing a platform where you can sell your products, place orders, customer inventory etc. This theme is best for blog, eShop, online store, eCommerce website. This is friendly and easy to access theme. Users can easily access its features. It is a advanced version and having a modified structure design. Zeon is compatible with WooCommece . WooCommece is the most popular eCommerce plugin for WordPress, which is used by many users. You can easily access its function without knowing any programming. 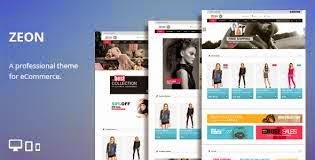 Some of its main features which include custom posts, built-in short codes, custom widgets, social media networking, modified design sliders and transition or animation effects, special offer sections, shopping cart, user account/ control panel. Its design structure is very vast. You can present your ideas with large spacing, bright colors and minimalist aesthetics. Also it offers stylish banner to advertise your products. Users are able to add different types of items to the shopping cart without reloading the page. You can sort your product list and attached to it. You can add predefined elements like Team Members, Offers, and Partners. All posts are sorted in an adjustable manner so that a user can provide a designed layout. Sliders are the advanced feature of Zeon. You can use these sliders to offer your special offers. Products etc. You can present your ideas in a special way which attracts customers. It having a social media support like you can share your social media pages on Facebook, Twitter, LinkedIn, Google Plus, Pinterest etc. It is an advanced feature of Zeon where you can send message and also subscribe to its newsletter. You can manage your subscribe form and its control panel. Zeon theme comes with extensive HTML documentation with some snapshots. It gives step by step instructions which help you to easily set up and customize your website and blog. 1. Responsive layout and Design structure. 2. Product management, shopping cart, orders, user account panel, payment gateways, and so on are included in eCommerce.